Lime Juice and Simple Agar Clarification. Lime: the Holy Grail of clarification problems. It has been a year since quick agar clarification changed my life. I was looking for a way to clarify lime juice without the help of a $15,000 rotary evaporator or a $20,000 centrifuge. Even if you have the equipment, these techniques produce only small quantities. Simple agar clarification solved all my lime-juice problems, and more. Read the post here. Why is lime juice so hard to clarify? It must be very fresh — lime juice that is even a couple hours old tastes over-the-hill. Freezing doesn’t prevent this deterioration, and neither does vacuum bagging. Some of the big-kid flavor houses have made great strides in industrial fresh-lime taste, but ain’t nothing like the real thing, baby. Most clarification techniques other than the traditional egg-raft take a lot of time — like days. Why do I care about clarifying lime juice? Gin and Tonics want lime juice, perfect G&T’s are directly carbonated (see here for video), and cloudy lime juice doesn’t carbonate well. Simple agar clarification is, as the name suggests, simple. It requires no special equipment, takes about half an hour, and can be done without overheating your juice (you hydrate the agar in boiling water and temper the juice back in). Read last year’s post complete with instructions here. In a nutshell: set your juice or whatever with 2 grams of agar per kilo juice. Break the gel up with a whisk. Put the broken gel in three layers of cheesecloth. Gently squeeze out the clear juice. Juices that last for a couple of days (not lime) tend to get partly cloudy on the second day. My guess is that some residual agar clumps together overnight. Dunno for sure. The bad news: I don’t have a way to solve these problems without some heavy duty equipment. The good news: I can solve these problems with a *reasonably* priced centrifuge. The super-speed floor-model centrifuge of my early lime juice tests – which can spin product at 48,000 times the force of gravity – costs well over $20,000, can blow apart if used improperly, holds only 500ml of juice, and is the size of a washing machine. I bought a 3 liter bench-top centrifuge on eBay for about 300 bucks (granted, an unusually good deal). It is safe to use, holds 3 liters a a time, and is the size of two microwaves. It can spin product at 4000 times the force of gravity –plenty of g’s agar clarification. Most centrifuges in this range can be equipped with 4 swinging buckets of 750ml each. Don’t bother getting a smaller one or a larger one. Read about our centrifuge here. Modified fast (but not as simple) agar clarification technique: Instead of using cheesecloth, break up the agar gel with a whisk, load it into the centrifuge, and spin it for 15 minutes at 4000 g’s. Yield is very high, no operator skill necessary, and the juice doesn’t re-cloud. I had used a similar, but not as effective, technique I called spin-gel clarification before I figured out the simple agar trick (post here); but I was too much of a bone head to combine the two techniques until very recently. Here we demonstrate the technique on orange juice. First set the juice with 2 grams of agar per kilo of juice and let it gel. Second, break up the gel with a whisk. Load the broken gel in centrifuge buckets and spin at 4000 g's for 15 minutes. Whammo! Clarified juice. 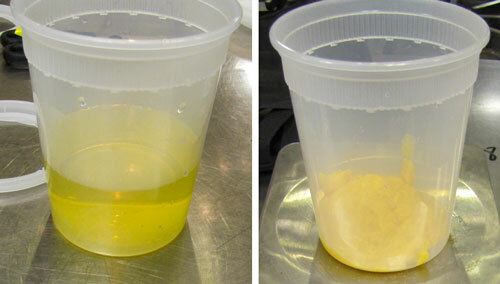 Left: clarified juice. Right: sludge from the bottom of the bucket. People often ask me about different clarification techniques. Here is a summary. Egg raft: You know this one. Filtration: I have not had much luck with filtration. I have tried pressure filters, vacuum filters, different filtration media, etc. – but have not been satisfied. Even products with particles big enough to be filtered easily, like stock, tend to clog filters pretty quickly. Chef Angel Leon has the clarimax filtration system – I haven’t used it yet. Centrifuge on its own: You need a really fast one. 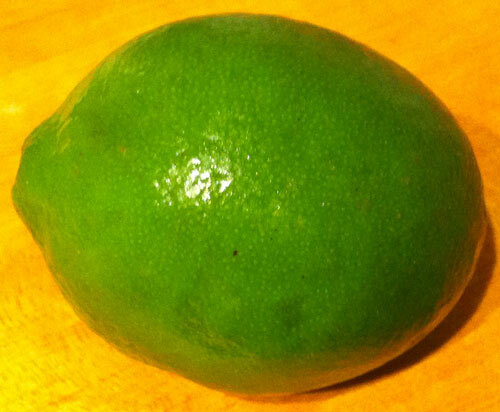 Lime juice can only be directly clarified in a centrifuge when subjected to forces in excess of 27,000 g’s. To make sweet tasting clarified lime in a centrifuge you need 48,000 g’s. Wow. Enzyme on its own: The cloudiness in certain juices, like apple juice, is stabilized by pectin. If you add an enzyme that breaks down pectin, these juices self-clarify in the fridge (we use Novozymes Pectinex Smash XXL and Pectinex SP-L, which we also supply –see here). The cloudiness settles to the bottom and the clear juice stays on top. Pour off the clear juice and you’re done. Be careful: don’t stir up the particles at the bottom of your container; they will go right through a coffee filter. The problem with this technique is low yield; the cloudy particles are suspended in a lot of good juice that never clarifies. Thick purees don’t settle out in a reasonable amount of time. Read about the technique in depth here. Enzyme plus Centrifuge: Unlike plain enzyme clarification, this technique can clarify thick purees like peach, nectarine, blueberry and strawberry. It also radically increases yield on thin juices like apple juice. We no longer use enzyme clarification without the centrifuge. The technique is simple: blend each kilo of whole fruit or juice with 2 grams of Pectinex SP-L and 1 gram of Pectinex Smash XXL. Allow to sit 20 or 30 minutes, then spin in a centrifuge at 4000 g’s for 15-20 minutes. We get something like 80-95 percent yield depending on the solids content of the product. even in the best of cases thawing can take a day or two. Simple Agar Clarification: See the explanation above. This is the only way to clarify lime juice properly. It is also a good technique for when you need product quickly. Simple Agar Clarification Plus Centrifuge: Simple agar clarification augmented with a centrifuge. If you have a centrifuge, this is the best way to clarify in a hurry. Hi Dave, I’m still slightly confused about how you do the agar clarification with heat sensitive juice (like lime). Do you boil 1 part agar 1 part water and then temper with room temperature juice? 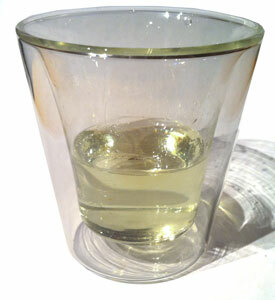 As an example: for every 375 grams of lime juice, boil 1 gram of agar in 125 grams of water. Temper the juice into the water and allow to set. Assuming your juice is room temp (about 20 C) and your boiled water is about 95 C, the mix of the two should end up at 39C, which is perfect. Set the mix over an ice bath and proceed. The lime juice doesn’t get heated much in this procedure, and the juice doesn’t really get watered down because the agar binds some water anyway. Have you looked into clarifiers used by brewers? I notice bentonite is missing from your list. I used this with great success to clarify some home-pressed apple juice last year for making jelly. Works as good on the fresh stuff as it does on the fermented juice. It’s also super cheap and requires no special equipment or temperature changes. bentonite might work somewhat, but it is a slightly diferent mechanism. This clay has a very high absorbence for proteins, thus it is used primarily in white wine production to absorb proteins that otherwise would be soluble. If you don´t do this later on the wine might fog once it gets accidentaly too hot in storage and the proteins denaturate. I´d go with diatomic earth / kieselgur, as I wrote earlier, this is a true mechanical filtration aid. Acutally sometimes a combination of the two might be benificial though, to also remove disloved proteins…. I haven’t tried bentonite. I have also never tried to clarify using gelatin suspensions the way winemakers do. Speaking of wine, after discussion with a colleague about banana wine – the topic turned to how one would clarify banana juice. Have you attempted anything similar? I don’t think we’ve tried banana yet. I’ll check. I’ve clarified roasted banana (pureed with water) via the simple agar technique. It worked fine, as I recall. And sure tasted good with rum. This statement should have a link in it??? Great post by the way. I use a centrifuge all the time mainly for air bubble removal. Ours here in the lab doesn’t spin quite that fast. It is a large volume centrifuge. Thanks for great research though! thanx for the nice summary on purification techniques! That clairmax mashine look a lot like my Rancilio Silva Espresso mashine! Like if you skip the kettle and pump directly from the water tank into the coffeee tray only fill it with diatomic algea. Anyways it was interesting to read that this gadget need tablets of diatomic algea as the means of purification! In the org chem lab we use them a lot to aid filtrations of nasty suspensions. We mostly use a real cheap version called celite. You should get that kind a stuff for a few pennies in any old style pharmacy. (Or from Aldrich). Putting a filter in that, then adding lime juice and celite, shake, filtrate, might be the most rocket fast way to go. I always wanted to order an AeroPress Coffee and Espresso Maker, now I have a reason to do so! Interesting idea on the aeropress. Angel Leon uses plankton (as opposed to other filtration media) in part because he is obsessed with products from the ocean. I saw him demo the first version of his plankton filtration about 5 years ago. At that time he just poured fish stock through the media after it had Ben loaded in a fine sieve ( no pressure). I have heard that the first stuff he was using was only effective on stocks, not on juice. I think he has changed his mix of plankton since then. I think it is supposed to work on juice now. I don’t know why he switched to pressure filtration with the coffee maker. Maybe it makes more efficient use of the media? What types of positive pressure filters have you used? Have you looked at stacking a filter with a larger pore diameter over your “clarifying” filter to decrease the rate at which you see clogging? We’ve used mainly cylindrical filters intended for water purification. We’ve tried tandem setups with different pore sizes. My experience with normal flat filters and pressures is second hand. Wylie tried the pressurized filters used for making wine. He said they would clog rapidly. massaging the sack??? hahaha….dave, ur a crackie. luv it. this is an awesome post, because its so hard to find such good detailed info out there, another reason why this is one of my fav blogs ever keep doin crack.its working. I have not. can you get it at a winemaking shop? Probably, but I can send you some ot beging with…Otherwise, contact BASF, they have two types, ‘disposable’ and ‘recycleable’, of course the latter is a bit pricier…Address? As far as I know, PVPP (btw: you got them Ys and Is mixed up) is an aid in wine making used to reduce the phenol and poly phenol content. It is not a filtration aid. this does not say it might not be beneficial, but it can alter the taste of you product. Like make red grape or maybe cranberry juice go boring in taste. Also both require a good filter (or a bed of Celite) to get rid of. Thanks for catching the typo…Indeed, PVPP is designed to mainly get rid off polyphenols and hence, reduce haze formation (due to protein/polyphenol interactions) in wine and beer – the latter being the main use for it. Non-desired effects reside mainly on bitterness and astringency – the first clarification will always remove small molecular weight polyphenols, so bitterness goes away first. It nevers hurts to try. I tried this using a 250 micron superbag, but it got *full* of agar bits – had to do the coffee filter overnight. Would there be any reason this wouldn’t work as well as the cheesecloth? I’ve never used the superbag, but 250 micron sounds big. The main thing is to “massage the sack” to get more product out and not squeeze so hard that you extrude the agar through your filter. If that doesn’t help, maybe you are breaking up the agar pieces too much before you filter. I just tried the Simple Agar Clarification technique on Clam Juice. I’m trying for a clear clam broth that I can then use to make a clear ravioli via edible gels. I used 500g clam juice & 1g Agar, followed the your directions, strained through triple-layer cheesecloth. The result was a little clearer — just not as clear as I’d hoped [still beige color]. Is it possible to get a truly clear liquid using this method? Any tips? I’m a home cook trying to make the chocolate wine from The Fat Duck and don’t have access to a centrifuge. I like your Simple Agar Clarification Method w/ Centrifuge idea, but instead of the centrifuge, do you think it will work if I put the ‘curds’ in a cheese cloth lined salad spinner and spun away? My friend and I are going to try it in a couple of days, but wanted to see if anyone else had tried it before we go down that road. No salad spinner. Your method worked beautifully. I hydrated the agar w/ a little bit of banyuls and set aside. I boiled the rest of the banyuls and reduced it to about half. Next I added the agar/banyuls mixure to the banyuls pot to boil. Then I followed the rest of the chocolate wine recipe from the Fat Duck and set it over an ice bath to set. Instead of using a centrifuge, I used your Simple Agar Clarification technique. Done and Yum! I’m off to take my precious liquid and millionaire shortbread to a Fat Duck pot luck dinner party. hey Dave – so I recently tried the enzyme clarification (with Smash XXL) on puree’d fresh tomatoes (strained first). I got about a 50% yield, but the problem is that the solids didn’t settle to the bottom, they floated on top of the clear liquid! I think it was because there was too much air still in the liquid from the food processor. Maybe I should have run through the vacuum first? Any other ideas? 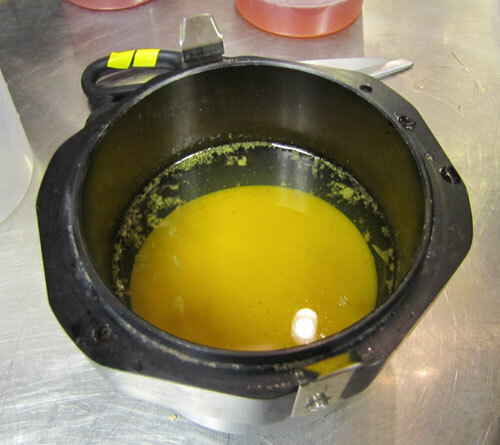 Unfortunately, I don’t have a centrifuge yet – my ebay skills still need a bit of work…. A vacuuming would definitely help. Air in the pulp won’t ever settle out. For anyone that is looking, Pectinex Ultra SP-L is available at http://www.modernistpantry.com/pectinex-ultra-spl.html. Pectinex Smash XXL is no longer available from the manufacturer, but is not required. You can just use straight Pectinex Ultra SP-L.